Robert Strange McNamara died this week at age 93. I understand this to mean that he had registered as a Republican in 1937 because of family tradition and, either through laziness or inertia, had never changed it. The Oakland Precinct No. 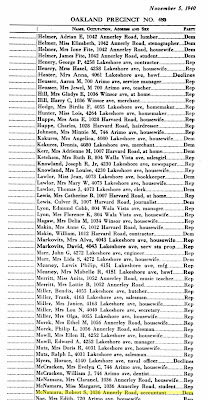 480 voter rolls for November 5, 1940 available on Ancestry.com, include the recent Harvard MBA graduate living at 1036 Annerly Road with his mother Claranel and sister Margaret, both Republicans. Robert S. McNamara, accountant, is listed as a Democrat. This means that sometime between 1940 and 1960 he had, one assumes knowingly, changed his registration to Republican. McNamara turned 21 in 1937, I think. He might have registered first as Republican, then changed to Democrat, and then back to Republican.